At Ballard, we regularly engage in conversation with innovators in the hydrogen production and distribution space. Hydrogen distribution is a key element in the success of fuel cell market adoption. 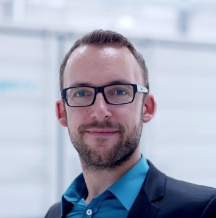 Recently, we had the opportunity to sit down with Dr. Martin Schneider, head of product management at Hydrogenious Technologies, to discuss the global transition to a hydrogen economy. Hydrogenious’ vision is to help move the much-discussed hydrogen economy from concept to reality: a reality where global energy needs for electricity, heat, and mobility are covered by green hydrogen. This hydrogen is produced from renewable energies, and is then distributed safely and efficiently using Liquid Organic Hydrogen Carriers (LOHC). How is the market responding to hydrogen as the energy source to replace fossil fuels? As you are aware, currently we use more than one million barrels of oil and liquid fuels per day. That is over a thousand barrels per second. The global economy has become addicted to fossil fuel. But now with diesel scandals, and emission problems all over the globe, especially in big cities, people are starting to recognize that this addiction to fossil fuel has to come to an end. Big policymakers have come together for the Paris Agreement, agreeing to face global warming and reduce our dependency on fossil fuels. There are global efforts to push hydrogen technology, including the roll-out of hydrogen refuelling stations, particularly in Europe and Japan, but also in the US and China. We can see the first commercial hydrogen cars from Toyota, Honda, and Hyundai. And now Daimler is bringing the GLC F-CELL, the world’s first plug-in fuel cell-hybrid vehicle to the market. China is putting in efforts, focusing on the roll-out of hydrogen and electromobility. They are focusing especially on hydrogen-powered buses and plan on imposing a ban on gasoline and diesel cars soon. Meanwhile, Japan is transforming its energy and mobility sector into the first hydrogen economy. With the Olympic Games coming up in Japan in 2020, hydrogen technology will certainly be highlighted on a whole new level. Where is Hydrogenious Technologies focusing its initial efforts and why? At Hydrogenious Technologies, we develop and commercialize a new type of hydrogen storage technology. The problems with hydrogen fuel include the current technologies that exist for storage and transport. Existing hydrogen storage and transport technologies are expensive and inefficient. They need to reach extremely high pressure or extremely low temperature to achieve high storage density. In order to bring hydrogen technology into mobility, we have to be able to store and transport hydrogen in a very easy and straightforward way. In order to bring hydrogen out of the highly regulated and complex industrial environment into every-day mobility, we need to rethink the way we store hydrogen today. How can you store and transport hydrogen efficiently and safely? With our LOHC infrastructure solution. To solve the problems of current hydrogen storage solutions, we’ve developed a technology where hydrogen can be stored in a fluid, which is non-toxic, hardly flammable, and non-explosive. The LOHC can then be transported at ambient conditions without the need for extreme pressures and temperatures. The liquid is used as a hydrogen carrier, and functions like a hydrogen sponge which can also be reused and recycled. This facilitates easy transport between the source and demand of hydrogen using standard oil infrastructure. With this technology, hydrogen can be transported in the infrastructure that already exists for fossil fuels. Compared to high pressure or cryogenic hydrogen storage, this method makes it very easy to transport the fuel. With five-fold high storage density and very easy handling compared to conventional hydrogen storage, this technology has distinct competitive advantages for large quantities of hydrogen and long transport distances. This is why we are focusing on the hydrogen logistics market, where our customers need to transport hydrogen at high storage densities over long distances to their industrial consumers or to hydrogen fuelling stations. This plays a major role particularly in the roll-out of a global network of hydrogen refuelling stations. How does the energy efficiency of hydrogen compare with fossil fuels? When comparing hydrogen to fossil fuel or diesel, you have to consider the whole lifecycle. For diesel or fossil fuel, you need hydrogen in refining to remove sulfur as well as massive amounts of energy to produce the fuels. We use this valuable hydrogen and energy to purify these fuels only to burn them again to generate CO2. This does not make a lot of sense! Why aren’t we taking all the hydrogen and energy currently needed to refine our fossil fuels, and applying it to our mobility sector? Hydrogen can be generated from essentially any primary source of power and then stored, transported, and used as a fuel. When looking at the whole lifecycle of fuel, you also need to consider the efficiency of the vehicle itself. Existing gas and diesel heat engines used in traditional cars have an efficiency of approximately 16 percent. And well-to-wheels only about 14 percent. Hydrogen powered cars have fuel cells, which are electrochemical devices and not heat engines and therefore much more efficient with more than 50 percent efficiency. Today, hydrogen represents an excellent opportunity to combine the energy and mobility sector and enable true zero emission mobility. The efficiency of hydrogen in fuel cell vehicles is already better than the efficiency you can achieve with gas or diesel. This does not even take into account that dinosaurs had to die millions of years ago to create the crude oil in the first place. H2 Deutschland is developing a German wide network of hydrogen fuelling stations in the next 5 years. How active are you in that initiative and can you comment on what other jurisdictions can learn from Germany? In Germany, H2 Mobility currently is trying to solve the chicken and egg problem that we see all over the world with hydrogen. If there are no hydrogen refuelling stations available, there cannot be any cars, and vice versa. This is why H2 Mobility was formed - to enable an initial network of hydrogen refuelling stations. They are aiming to build up the first hundred refuelling stations by 2020, and first 400 by 2025. The shareholders of this consortium are large oil and gas companies and OEM’s including Shell, Total, OMV, Linde and Air Liquide as well as Daimler, and some associated partners. It is also supported by the German Federal Ministry of Transport and Infrastructure, with almost 250 million euros in funding until 2019. There is also additional funding from the European commision FCE JU. With support from the federal level and the European level, H2 Mobility is able to roll out this initial network of hydrogen refuelling stations specifically focusing on fleet operators, talking to communities, bringing local cities and authorities on board and working with fleets to generate initial demand. Hydrogenious Technologies supports H2 Mobility on their mission to build up a German wide hydrogen refuelling station network and we will work more closely together with H2 Mobility in the near future in order to build up hydrogen refuelling stations using our LOHC hydrogen storage technology. Can you speak to other regions around the world that are supporting the development of hydrogen technology? Japan and California have several programs supporting the massive roll-out of hydrogen fuelling stations. They are also supporting the operations at these stations, which is essential during the early years of development. Additionally, there is funding available for the FCEV cars, if you buy or lease them. China is on the forefront of hydrogen mobility, particularly with respect to hydrogen buses such as the the Ballard projects in the Guangdong province. Here our LOHC technology can help to build up the non-existing hydrogen refuelling infrastructure in China. This is where we see large market demand and where we get a lot of inquiries for LOHC-based hydrogen refuelling solutions. In California, the ZEV mandate is helping action change for large car manufacturers. They have to sell a certain number of zero emission cars, in order to sell cars in California at all. This puts OEMs under pressure to actively promote zero emission mobility. Other countries, including Germany, should certainly adapt that model in order to facilitate the roll-out of zero emission mobility over the upcoming years. What needs to happen for hydrogen technology to become more widely adopted? Typically the first adopters are penalized. They create the infrastructure and network and other people ride on the back of what has been created. Halfhearted commitments do not help in this space. Therefore, sufficient public funding and a full commitment of key industrial players is needed to ensure that the infrastructure gets developed. Our technology for hydrogen storage in LOHC can help reduce operating costs for hydrogen refuelling stations, as well as storage and delivery costs. With LOHC, you can transport hydrogen at fivefold the storage density compared to standard 300 bar compressed hydrogen tube-trailers in a conventional tank truck at ambient conditions. The LOHC can be stored in standard underground oil tanks, just like gasoline and diesel. This will also enable us in reducing the footprint and increasing the safety at the hydrogen refuelling stations. Success will be achieved by the right political will and framework, along with a strong willingness for the end customer to switch from fossil fuels to hydrogen. I think these are the factors that will make hydrogen and initiatives like H2 Mobility a success story. What are some optimistic timelines for the adoption of this technology? We are convinced that hydrogen technologies are on the breakthrough. This is evident from the initial fuelling station networks that are being built up in Europe, the US, and Asia and the increasing investments in the field of hydrogen and fuel cell companies. Hydrogenious Technologies will realize the first LOHC-based hydrogen refuelling stations in 2018 and we aim to roll out our technology in China, in the field of bus and truck refuelling in the upcoming years. By 2025, we will see a massive increase in the networks available, and more car makers will enter the market. We definitely see the breakthrough of hydrogen fuel technology happening by 2020, or by 2025 at the latest. German car manufacturers are coming to the market and if they do not want to lose the race in zero emission mobility, they will have to be quick in commercializing fuel cell vehicles. China is likely to dictate the roadmap over the upcoming years. The hydrogen economy that has long been talked about, is becoming a reality. The technology has the support of the end users, industry and policy makers, and new infrastructure and vehicles are being increasingly developed. Now, we need the commitment, funding, and the political framework to make this happen. The Paris Agreement has set out the framework to reduce our emissions, and we need new technologies to tackle these issues. Every new technology needs support on many levels including political support, a strong financial framework, and companies and early adopters that believe in this technology. Let’s work collectively to continue to increase traction, commercialize hydrogen solutions, and build the much-needed hydrogen refuelling networks in countries that are ready for the technology. In doing so, we can all drive the hydrogen economy forward and make it a reality, together.